The United States Congress designated the Wenaha-Tucannon Wilderness (map) in 1978 and it now has a total of 176,737 acres. Oregon contains approximately 65,266 acres. Washington contains approximately 111,471 acres. It is managed by the Forest Service. This Wilderness is a maze of deep, sheer-walled canyons that cut into what was once a flat and expansive plateau at the northernmost reach of the Blue Mountains located in Northeast Oregon and Southeast Washington. The plateau has since eroded into long ridge tops and wide, forest-covered mesas that now stand as much as 2,000 feet above the drainages. Following ridges will often bring you to a bluff line that fall away vertically into a confluence of drainages. Much of the area's water runs south into Oregon's Wild and Scenic Wenaha River, although some of it slips north into Washington's Tucannon River. Ponderosa pine dominates the lower drainages, then defers to a forest of lodgepole pine above about 4,500 feet, with some larch, fir, and spruce. Subalpine fir reigns supreme at the highest elevations, with native grasses and forbs covering the ground. Elevation ranges from nearly 2,000 feet at the Wenaha River to Oregon Butte which is the tallest point of this vast wilderness at 6,401 feet. Rocky Mountain elk thrive in this area, which seasonally attracts more hunters than hikers. Rattlesnakes love the area, too, and you may see mule deer, white-tailed deer, black bears, coyotes, cougars, bobcats, and snowshoe hares. You might even be lucky enough to catch a glimpse of Big Horned sheep. Snow falls and accumulates about five feet deep between November and April. Summers are typically very hot and very dry. Approximately one-third of the Wilderness lies in Oregon (see Oregon, Wenaha-Tucannon Wilderness. Approximately 200 miles of trail system stays high on the open ridges, winding and connecting often enough to provide long loops through the Washington side and down into Oregon. Entry points can be found in both Washington and Oregon, with Three Forks, Godman, Troy, Cross Canyon, Hoodoo, Elk Flats and Timothy being the most easily accessed trailhead locations. 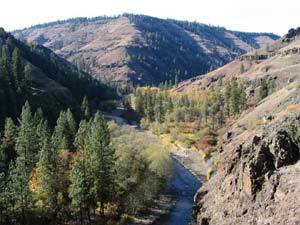 Planning to Visit the Wenaha-Tucannon Wilderness? How to follow the seven standard Leave No Trace principles differs in different parts of the country (desert vs. Rocky Mountains). Click on any of the principles listed below to learn more about how they apply in the Wenaha-Tucannon Wilderness.